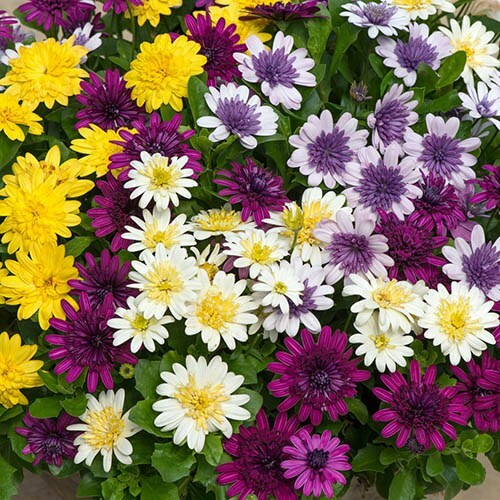 This pretty new Osteospermum is the perfect plant for colourful summer containers and unlike other kinds, the flowers stay open day and night so you can enjoy them even more. The blooms have a striking double centre and are very weather resistant. Add this to its neat mounded habit and you have a plant that will thrive in the sunshine yet withstand the worst of summer storms. The collection contains three lovely colours Lemon Ice, Purple and Violet Ice. Supplied as a pack of 12 plugs (1.5 - 2cm diameter), 4 each of the colours shown. Pot on for 4-6 weeks and move to final position after last frosts.